It’s time for another blog hop from the ESAD (Extremely Special Aussie Demonstrators) group, this time to celebrate the start of Sale-a-bration. And this time we have even more blogs taking part, which means more ideas and more inspiration for you. So I hope you have fun on your way around. Stamp Sets: Vintage Labels (Only available during Sale-a-bration), Baroque Motifs. Cardstock: Basic Black, Naturals Ivory, Belle Bleu Designer Series Paper. Accessories: Wide Oval Punch, Sponge Dauber, Black Brads from Vintage Brads. That’s it for me for now. Next stop on your way is Christie Wallace from Christie’s Creative Corner. And if you would like to be in the running for some blog candy, make sure you leave a comment for us all. And if you are a Stampin’ Up! demonstrator from Australia or New Zealand and you would like to be part of this terrific group, just click on the ESAD link above and it will take you to our home page. Great use of stamps and it suits this heritage page. I think you pulled off the vintage look. Well done! This is beautiful. The “vintage” definitely works. Just gorgeous. Love your page Chris! Thanks for participating in the ESAD Blog Hop. Love the scrap page – love how this set is so versatile. What an original idea! Great job! That’s an interesting way to use that stamp!!! Very inspiring!! Never would have even CONSIDERED to use the stamp in this way CHris. Almost like the links in a chain. Fits the page perfectly. Awesome job and great lateral thinking. Gorgeous work and loved what you did with that stamp set. Excellent use of the Label stamp. beautiful, your page is so elegant. vintage labels – how appropriate! I like your layout, so simple and effective, my kind of scrapbooker! Just beautiful, I love the vintage look. Very creative use of the stamps. Love the vintage scrapbook pages. Yours is beautiful! I really love your page. Thanks for sharing. Must add this stamp set to my (ever increasing) stash. Thank you for showing me how good the vintage labels stamp set can be. It is very clever. Great Idea … it tooks some seconds before I regognize the Vintage Label on your Layout ! Wow – I love how you’ve used that! Well done! Love the baroque stamp. Always need clues of how to integrate stamping and scrapbooking – love what you have done here – thanks! Great vintage touches for a special memory! Love the vintage look. Thanks for sharing. 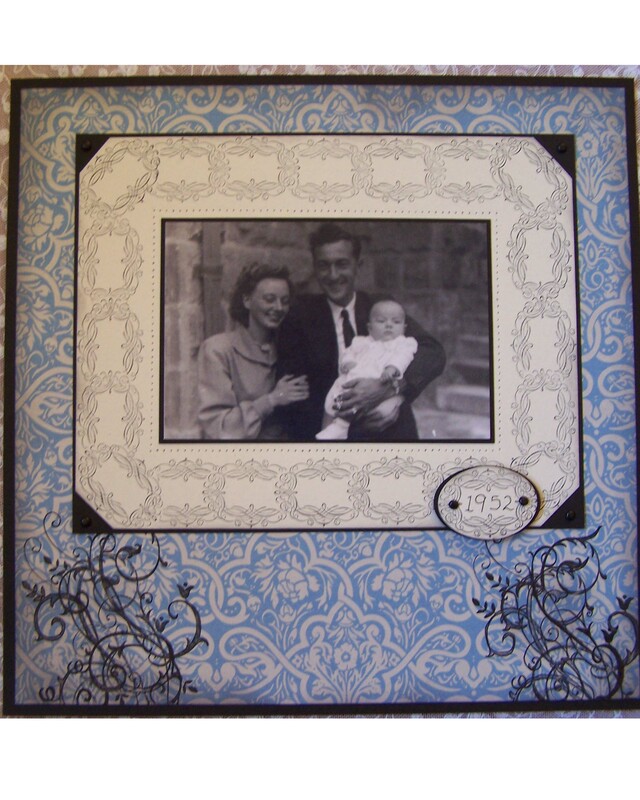 Hi, Chris, Just love the way you have used your Vintage stamps, it goes very well with your lovely scrapbook page. Cheers. PS love the cat, a very pretty one, is he yours. What amazing ways to use the Vintage stamps sets – just gorgeous – thank you for sharing! Wow that’s such a lovely heritage layout. – thanks for the ideas and inspiration. I really can’t wait to get my set of vintage labels! I love this layout 🙂 Can’t wait to try it myself. What a fab way of using the frame from Vintage Labels! I just have to have this stamp set now!! Love it Chris. Thankyou for the inspiration.